Kylie, always kind, loved to feed the wild birds. It is so important to give of yourself. Giving, even a smile, can help you lower stress and lower your blood pressure. When your mind and body feels gratification from giving, you relax and the blood flows freely. I am reminded of my truly wonderful days in Scouting, To “do a good deed daily” was the goal. And the positive influences of this dynamic program deeply impacted my life and the philosophy of our school. Scouting, at its core, is dedicated to giving of yourself and becoming aware of and developing an appreciation for all that is so breathtakingly beautiful in Nature. It teaches us to “Be Prepared” and do so by protecting ourselves with our God given natural resources. My Mother, Marie, and Werner Bendorf, present the Eagle Scout Award to William (Skip) Anderson. As an Eagle Scout (at the tender age of 12) and later as a Scoutmaster of Troop 57 in Abilene, while enrolled in college, I became the beneficiary of a proud tradition. My fondest memories of my youth are centered in Boy Scout Troop 17 and in being with our beloved Scoutmaster, Werner Bendorf. Having survived the Holocaust, he especially appreciated life and he endeavored to share his truly dynamic love of living and his very special love for everyone around him. Privately, he shared with me, among many things, that forgiveness was the only pathway forward in life, the only way home. And there was so much that happened in his life for him to forgive. The transgressions felt in our lives simply cannot ever compare. I can truly say that without the compassion, understanding and deeply felt love of this man for my Mother and myself, I could not have survived. I am in tears as I write this and simply cannot continue, at this moment, to share more with you about the special gift of Werner’s life. But I plan to tell the full story, later, of the stunningly beautiful gift I received, when our lives intersected.This precious man may no longer be with us, but I can assure you that his spirit resides deeply embedded within every fiber of my being. As I remember all the love he shared so willingly in life, I can feel his heart still beating within me. Yes, the love you give to others is the only thing you will ever truly possess. And it shall be yours forever. Because of such caring people, and that of my loving family and friends, the story of my life begins and will end with Love. Above you will find my very favorite quote, from Johannes Eckhart. So now, my prayer in life is one of Thanksgiving. Dear Lord, and my dear and precious family and my wonderful friends, from the very depths of my being, I want to sincerely “Thank You”. From you I have found the Love of God. The NO VACANCY sign is always out. Mankind’s first home was an unbelievably beautiful Garden, not a crowded, polluted city. And I believe that one simple solution to so many of our problems lies in returning home, going back to Nature, searching for the overgrown pathway that leads back to the Garden. Realizing just how happy we can be, requires us to think about simplifying our lives and becoming intimately and closely connected to the stunningly beautiful natural world around us. And a part of that natural world includes our delightful and beautiful friends, the Birds. They are an absolutely critical part of our survival. But, my friends, they are now threatened by pollution and our destruction of their habitat. Yes, when our homes were constructed, the trees were uprooted and the wildlife was given absolutely NO consideration. If you want to know who owned this land before we did, or even the Native Americans, look up into the relatively few trees that are left. The real deeds to our properties, were in the good deeds of Nature’s beautiful inhabitants. Our feathered friends, and protectors, are not just beautiful to look at and listen to. We need them to control the insect population, transfer pollen around, move nutrients from the sea to the land and clean up the environment. They are the best and safest natural pesticide you could possibly employ. And how do you lure them to your yard? I love working in the yard and have been adding bird houses and bird feeders and baths. Dr. and Mrs. Anderson seem to be enjoying life. But why the fur coats – it’s 94 degrees and what’s with the “Cool Dude” sunglasses? To diminish mosquito populations, attract birds that eat insects on the wing (they catch flying insects in the air). The main ones are swallows such as the tree swallow, violet-green swallow, barn swallow, eastern kingbird chickadees, house wrens, gray catbirds, bluebirds, vireos, etc. The International Union for the Conservation of Nature recently classified 97 species of birds as globally threatened. And what can we do to help? Well, a truck load of common sense would help. Ian fed the birds and then helped himself. We must act now to stop the process of global warming. Warmer environments lead to mosquito-borne pathogens that kill species like birds, horses and, you guessed it, people. My dear friends, at this critical moment the birds need us, just as we need them. If you care about our children, if you love being in the natural world, if you enjoy employing common sense, there are a few, simplistic things you can do. 1. All Electric cars are fast becoming available. Please make it a priority to buy one. Make your next purchase a car that can be charged with solar cells or a small windmill (you can make it a vertical model that will not knock the birds out of the sky). Tesla CEO, Elon Musk, has hinted that his firm is considering “freeing” its patents to help speed up electric car development. If by some coincidence, hanging by the slenderest gossamer thread of fate, you should chance to read this, Mr. Musk, I beg you, on behalf of all humanity, to please do so. And, as you are well aware, you can do so much more than this. Elon, I ask that you make the spirit of Ben Franklin, which embodied the very essence of what makes America such a good and Noble idea, and the rest of us, very proud of you. Ben, as I mentioned last time, contributed to the world by giving to it his many inventions at no cost, refusing to own patents on any invention. He never patented any of his inventions. He was willing to share his ideas for the benefit of all, and without personal gain. Elon Musk, you are very close to becoming a true patriot, like Ben Franklin. A patriot is one who devotes his life to serving his country and his fellow citizens. And our Nation is today in critically desperate need of such men and women. We need true patriots, like America’s educators, who can put the well being of the Nation and its citizens above the self. An unimaginable depth of compassion for others, exemplified by the life of Franklin, is necessary today for the survival of our children on this planet. Perhaps, Mr. Musk, you can go beyond inclusion in the annuals of mere History. Perhaps you can become deeply embedded in the hearts of your fellow Americans. My prayer is that you become so enlightened. 2. Eliminate plastic bags from you shopping habit. This needs no elaboration. 3. Place a birdhouse, birdbath and bird feeder in your yard. Kirby, will you take out the, uh, well, uh, never mind. 4. Stop using pesticides! You do not need them. And your children will truly suffer from being exposed to these extremely toxic chemicals. Use the birds (dare I say, and bees?) instead. They will eliminate the pests. At our school we do not use pesticides. We provide birdhouses, bird feeders and bird baths for our special friends. And they give us an environment for our children that is virtually free of such things as misquotes (the deadliest creature known to man, that kills more people on earth than any other creature – known to carry over 550 viruses, and many of them, like malaria, estimated to kill over 600,000 people each year, west Nile virus and yellow fever, among many others. Saffy, will you take out the trash? Economically priced bird houses, feeders and baths are simple, effective solutions to helping the birds and your family. 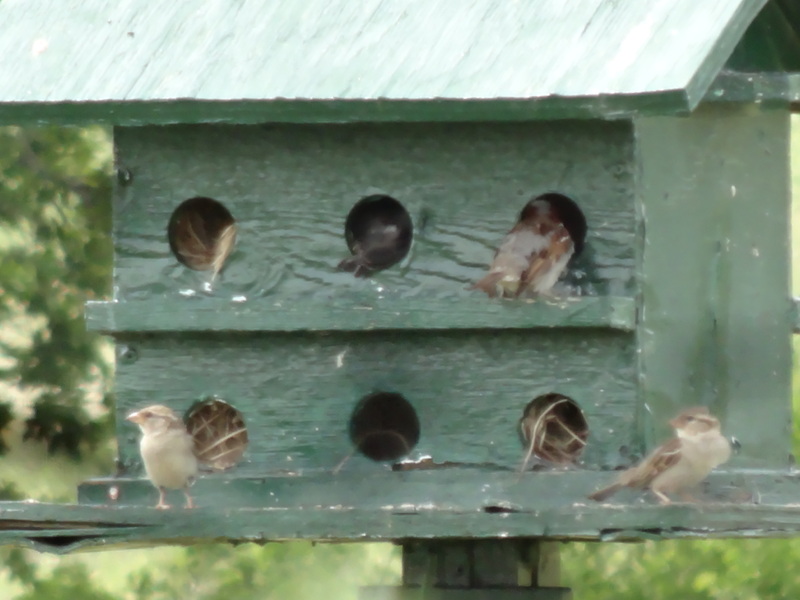 Providing for our feathered friends is a natural method of controlling pests. Another is simply leaving as many wasps/yellow jackets alone as much as possible. They devour mosquitoes and deadly spiders and are not naturally aggressive. Instead of spraying insecticides all over the place, spray the wasp nests with water from the hose and knock down their nests. This encourages them to move, but not far away. Later you will find them on the outer perimeter of your property, where they can live in peace and save your life. Lila, will you take out the trash? Pesticide exposure has been linked by good and solid research to cancer, birth defects, infertility, multiple sclerosis, epilepsy, gastrointestinal disorders, reproductive problems, degenerative diseases such as Dementia (by as much as 70%), Parkinson’s disease (a 70% increase as well), Alzheimer’s disease, Type II Diabetes and many others. Studies show that chronic low-level pesticide exposure is associated with a very wide range of nervous system symptoms such as: headache, fatigue, dizziness, tension, anger, depression, and impaired memory. Child IQ loss has been linked to pesticide exposure in the womb and can elevate the odds for ADHD in children. OK. I’ll take it out myself. Think about it. We share this small planet. And as they fly, feed and nest, the birds help us in countless ways. Birds and humans are complex and vulnerable organisms. We are, like other species, co-dependent. At the end of the day, the fate of the birds will also be our fate. This entry was posted in e-News Update, Gift, Gifted and Talented Children, Life, Schools and tagged anderson, Anderson Private School, anderson school, andersonschool.net, back to Nature, Be Prepared, Ben Franklin, bird houses, birds, Boy Scouts of America, do a good deed daily, Electric cars, Elon Musk, feathered friends, Forgiveness, global warming, God given natural resources, Holocaust, important to give, International Union for the Conservation of Nature, Johannes Eckhart, Mankind's first home, Marie Anderson, mosquito-borne pathogens, Scouting, Stop using pesticides, Tesla, texas, Troop 17, Troop 57, Troop 57 Abilene, Werner Bendorf by asgtc. Bookmark the permalink.